Global digital agency, Isobar has won the Grand Prix in the Digital Craft Lions at Cannes Lions 2018. Cannes Lions, the most prestigious creative award in the world, awarded ‘Aeronaut’, a world-first VR experience for William Patrick Corgan (aka Billy Corgan of the Smashing Pumpkins). Directed by David Liu and Rob Ruffler, the powerful content was designed as a fully immersive and participatory VR experience, and 2D video was filmed within the VR experience using Cinemachine, a new software tool from Unity, a creation engine. The 2D video was filmed inside the 3D VR world and was imagined by San Francisco artist Danny Bittman using Tilt Brush and Blocks from Google, and brought to life by entertainment network Viacom and the Isobar US team. The team captured Corgan’s three-and-a-half-minute performance in volumetric video at Microsoft’s Mixed Reality Capture Studios, Isobar, Viacom, and Bittman were able to place Corgan inside Bittman’s creative world, and use Unity to take viewers inside that world as well. At the Mixed Reality Capture Studios, Isobar filmed the performance on a stage using 106 cameras, then used computer vision algorithms to create textured 3D surfaces of everything in view. The team then further processed the resulting holographic video to provide some consistency in the meshes over time as well as compressing it for easier transmission and viewing. The team then worked inside of the VR experience by collaborating, reviewing designs, and discussing interactions. The two experiences were created over the course of a year, beginning In November 2017 with the 2D video was launch, coinciding with an event that shared a preview of the VR experience. "Aeronaut demonstrates how virtual reality can make an impact beyond headsets,” said Rob Ruffler, co-Director. “In a world where the head-mounted display is the best available screen, music fans need not miss out for lack of access to the latest technology." “It is extremely humbling to be considered, much less win the prestigious Grand Prix,” said David Liu, co-Director. 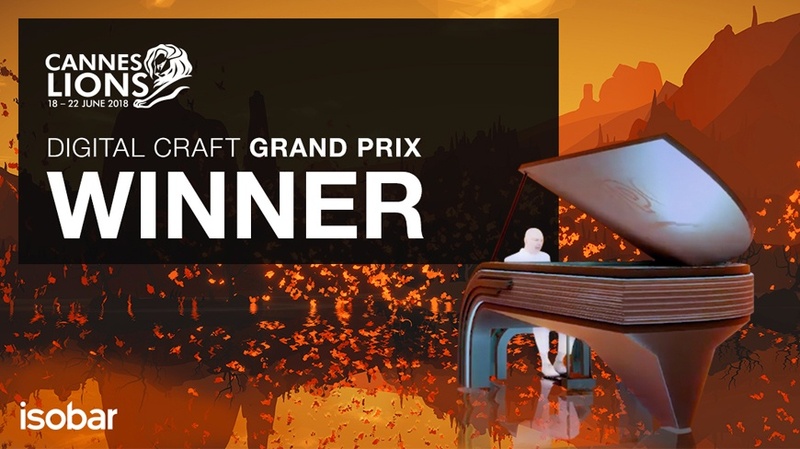 “We’re grateful to be recognized for this innovative, adaptive and constantly-evolving music experience in VR, and hope that this will inspire many more spatial music experiences to follow." It was also previewed at Business Insider’s Ignition 2017 Conference and at CES 2018 in the Dentsu Aegis Network Clubhouse. The world premiere of “Aeronaut VR” took place in March 2018, at SXSW's Virtual Cinema and will be available to the public later this year. “Aeronaut VR” has been described as the highest quality representation of volumetric video capture and playback in the marketplace.